"Oh, hi! Come on in." "What's that? Oh yea, I have plenty of dinner. Come on in, make yourself at home." "We are having Beef and Broccoli with Garlic Sauce. Would you like a glass of wine?" "It's Grande Fleur de Lyeth Reserve 2009. From Sonoma County, California." "What's the best thing to do with a big, rich, ripe and hearty red, you ask?" "The first thing you can do is decant, and allow it to breathe for a little while before serving." "Serve with a leg of lamb, herb-encrusted pork chop of spare ribs. It also partners with hard cheeses well and works with many Italian pasta dishes." "I think it will pair well with our Beef and Broccoli with Garlic Sauce. Please make yourself comfortable and let's have a bite to eat." Trim fat from beef steak; cut beef lengthwise into 2-inch strips. Cut strips crosswise into 1/8 -inch slices. Toss beef, 1 tablespoon vegetable oil, the salt and white pepper in medium bowl. Cover and refrigerate 30 minutes. Pare outer layer from broccoli stalks. Cut broccoli lengthwise into 1-inch stems; remove flowerets. Cut stems into 1-inch pieces; Place broccoli in boiling water; heat to boiling. Cover and cook 2 minutes; drain. Immediately rinse in cold water; drain. Mix cornstarch, sesame oil and broth. Heat wok until very hot. Add 2 tablespoons vegetable oil; tilt wok to coat side. Add beef; stir-fry 2 minutes or until beef is brown. Remove beef from wok. Heat wok until very hot. Add 1 tablespoon oil; tilt wok to coat side. Add garlic, ginger root and bean sauce; stir-fry 1 minute. 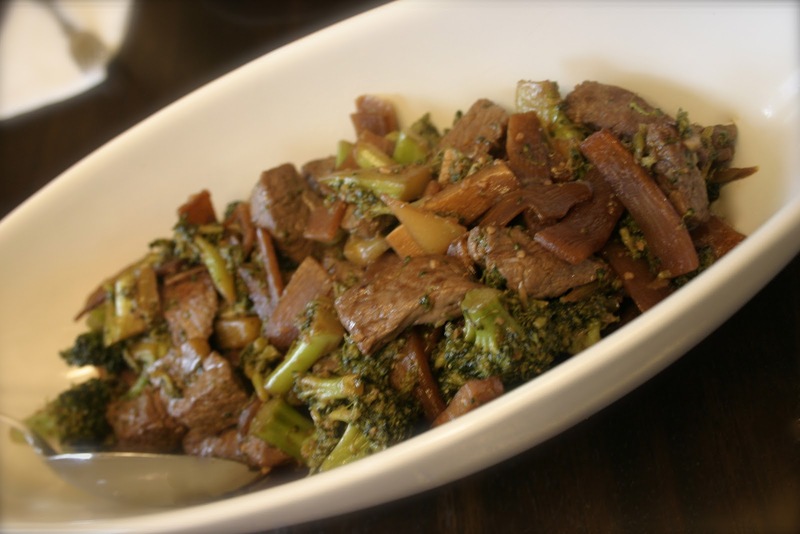 Stir in beef and broccoli. Stir in cornstarch mixture; cook and stir 15 seconds or until thickened. "I hope you saved room for dessert! We are having Raspberry-Hazelnut Meringue Cake. It's da bomb baby! It's a really light dessert and perfect for this warm evening. I'm having some for breakfast with my coffee in the morning." "Thanks for stopping by! Have a nice evening." @Pegasuslegend - What a great idea! Thanks for the tips.